I'm so excited to announce that I have a book coming out in May 2019 from Rowman & Littlefield! Though it's not released until mid-May, I spent so much of 2018 researching and writing that I knew I needed to include it for a year-end wrap-up post. I can't tell you how many of my hours (waking AND trying-to-sleep) have been spent thinking about this book. I can't wait to have it in my hands and look through it! I have always been passionate about volunteering, so the pitch was a no-brainer! I volunteered for a few non-profits as a child (with my mother and grandmother), and continued that as an adult. Volunteering really changed my life - a simple weekly volunteer commitment turned into a career that altered my path. I helped with a weekly art class at SRVS, then was hired to be their volunteer coordinator! With help from PR and the Learning Center, I created a program from the ground up, based on my experiences volunteering. I went on to volunteer in libraries, then become a volunteer coordinator at a library branch. I took my knowledge of library volunteering to the public schools, and created volunteer opportunities for elementary students in the school library. In my current position as a Montessori elementary MakerSpace Librarian, I'm still using volunteers within the school, and hoping to broaden our scope to include outside opportunities as well. Phew! All of that to say - wow! I am so proud that the first book I'm publishing is going to be a Practical Guide for Librarians. 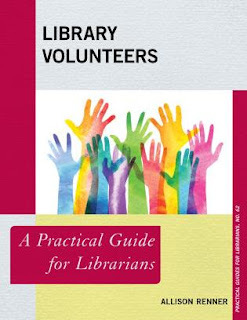 They have Practical Guides for any library-related topic you can think of! I can't tell you how many times I consulted these books during my MLS and work in public and school libraries! I used them expensively over the summer to help build our school's MakerSpace. These books have helped me in so many ways, because they are so easy to consult and put into action! They look like textbooks and are very informative, but the information you get from the books can be used immediately. Real life applications and examples are given, and they are a great resource for the library community. I'm hoping that my book will be used in other fields, as well! A lot of the information I pulled from were my own experiences volunteering with nonprofits, period - not just libraries! And honestly, the groundwork of creating a volunteer program can apply to so many different fields. Examples of job duties are fairly library-specific, but the sample paperwork and overall guidelines included can help any organization who can use volunteers, so I hope it's used in that way! It's even on Amazon for pre-order! AH! 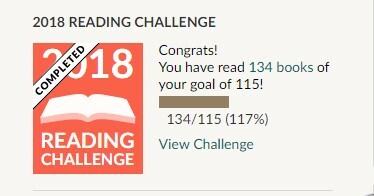 I didn't do a full-on Reading Challenge this year with certain genres to check off, but I did challenge myself to read 115 books via Goodreads. I read 134 books and completed the challenge! Check out what I read in 2018. 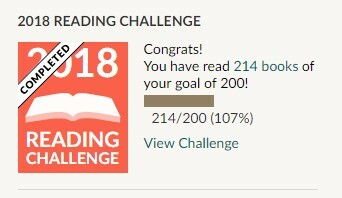 I also challenged my son to read 200 books via Goodreads, and we did it! See what we read together in 2018. For 2019, I'm challenging myself to read 120 books and write two sentences about each. I want to read more of the books I'm hoarding on To Be Read shelves, as well. I've been really good about not BUYING new books, but my library card is constantly maxed out. I see books on bookstagram or am recommended by friends and family and put them on hold, and never get around to reading what's already in my house! I'm also determined to get this blog started back up again - maybe more as an informal book-related journal than a book review blog, though. I'm challenging my son to read 222 books, just because I think that's a nice random goal to have that we can easily meet! I have to admit that we didn't read every night this past year, and I'd like to make sure we prioritize bedtime stories this year, so having a higher goal will help us with that. This year I had it together enough to do the 12 Days of Christmas Storytime with my son. Our bedtime routine lately has been a little rushed, as we get home late from after-school activities or have errands to run, so it's been a race to get dinner, bathe and brush teeth, and get to bed at a reasonable time before we have to start all over again. Sometimes I'd be too tired to wait for my son to pick a book and read it to him, and often it was the same one we'd just read a million times. I know that everyone has favorites, and re-reading books with kids is only good for them, but... I mean, I was really tired, ok? Mom-shame all you want, but some days, there was no way a bedtime story was happening, no matter how much he wanted it. And I'm sure you can imagine how much it hurt my librarian-mom heart to say no, but for sanity's sake, I'd have to. 12 Days of Christmas Storytime helped us make sure we prioritized reading together. My son loved opening a new book every day. The best part is - they weren't all new! Many were bought heavily discounted when our local bookstore closed last year, and I had tucked them away so I wouldn't give my son a ton of new books at once. Others were bought at our school's book fair. Others were bought from a used bookstore or from the library's discard cart. There's no need to break the bank if you want to do this with your kids! It's definitely possible to keep it affordable. I used a patchwork of leftover wrapping paper scraps, so I didn't have to buy or use new resources for that, either. Some were even wrapped in brown kraft paper, or a layer of tissue paper! My son is young enough to not care about presentation (if he ever will?) as much as the opening part! I'm definitely going to start stockpiling books to do this again next year! I might even keep an extra stash of new-to-us books to use as incentives when it seems like we're not going to get a bedtime story that night. I think it will inspire both of us to get our chores out of the way and get ready for bed! Check out the books we read for 12 Days of Christmas Storytime on Instagram - @howifeelaboutbooks.